I stirred in a slow release organic veggie fertilizer, crushed egg shells (and/or oyster shells), along with peat moss, vermiculite, compost, and a bit of potting soil. The shells will slowly release calcium which prevents blossom end rot. Also, I am trying a new trick I learned. 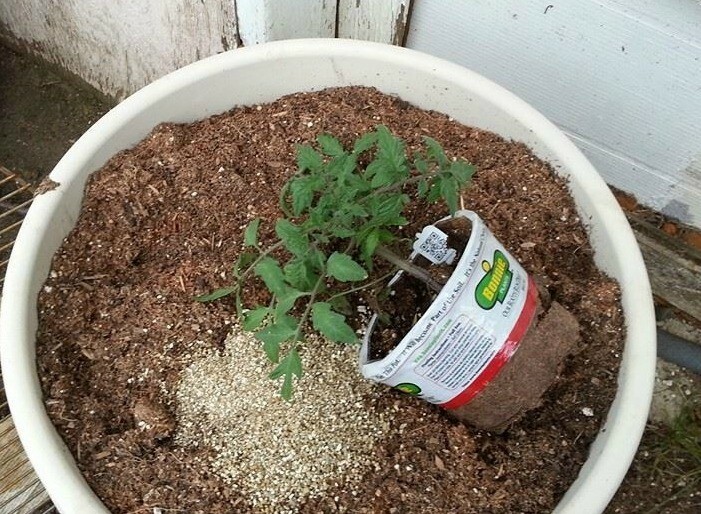 You lay the new tomato plants on their sides, in their store bought pots, for a couple days. This causes the top end of the plant to reach upwards, towards the sun. Once it has grown upwards, cut off the leaves on the part that is parallel to the ground. 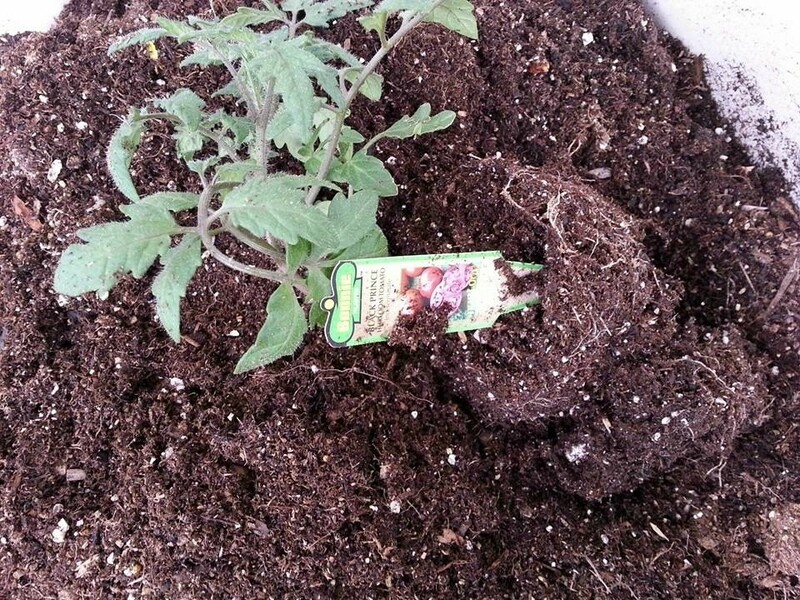 Make sure the stem is in contact with the dirt, as this encourages roots to sprout where the leaves were. Once it starts showing new roots, bury that part of the plant completely in soil. This is supposed to double the plant's tomato output. It also makes for a sturdier plant that is less top heavy and is more capable of supporting heavy tomatoes. That way if a branch breaks from the weight of giant tomato, you run less risk of losing the entire plant from having it break or split the main stem. It also will help the plant take in way more nutrients as it has more roots then a plant just potted in the ground straight up and down. Interesting. I know if you plant normally and then keep adding dirt to the pot then the stem will produce more roots but never heard of laying it down first. Please let us know how it goes, it's too late for me to try it this year. Good idea ! I will try it ! It should work well because the wild plants discovered in South America from which originate the today's tomato plants were and still are creeping vines. We force the plant to grow upwards but it is in fact a creeper not a climber. The only thing I will change in your soil recipe is vermiculite. I use to add vermiculite to my plants soil but since I have learned that vermiculite is a natural geological neighbor of asbestos and sometimes neighbor of one of the most dangerous type of asbestos I have decided that vermiculite is not useful enough to take the risk of inhaling particules of asbestos. Vermiculite interest is to keep water and warmth (that's why it is used to help reptile eggs to incubate) it is also used because it keeps the soil aired and light weighted but sand and gravels also aired the soil without danger for your health and if you want the plant to keep steady you do not want the soil to be too light weighted. You work hard to have beautiful healty tomatoes, but to keep the gardener beautiful and healthy too do not take the risk of asbestos. Thanks a lot for sharing the trick ! I for the first time I added eggshell and Epson salt into the dirt surrounding the roots of a newly planted cherry tomato plant and noticed that the plant did branch out more and got a lot taller and I got a pint of large cherry tomatoes. It is still blooming and producing a tomato here and there ( got one this morn). Usually tomatoes stop this time of year. Its too hot in southern TX but it it survives the heat it will continue to produce until the frost. 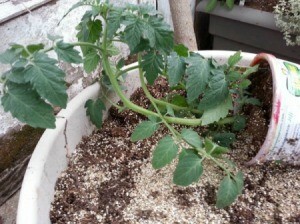 For generations the proper way to plant to tomato was to tip it like this in a trench..makes stronger root system. On your list of things, you forgot the magnesium sulfate...needed for any thing blossoming. It is also for the end rot..get enough of the mag sulfate (EPSOM SALT folks). I also lay newspaper around my tomato garden, need to reapply every couple weeks...wet it after laying around plants. Keeps weeds down, you can see the needed ventilation space (10 inches from ground) that is also needed for the bottom rot. I have raised beds of garden all over my yard..blended with flowers and vegies...some have wonderful friends...tomatoes don't like many...herbs of Basil and dl do well with them. MINNESOTA GRANDMA!!! You can just go ahead and remove the bottom leaves of your little tomato plant when you get it (and especially if it is a tall, lanky plant), and plant the plant sideways, laying most of the stem down to be covered by the dirt, with only a few inches of the top sticking out. You do not need to go through the lengthy procedure described as the plant will turn upward in a few days, and roots will grow underground. We have done this for years to create a sturdy, well-producing plant.